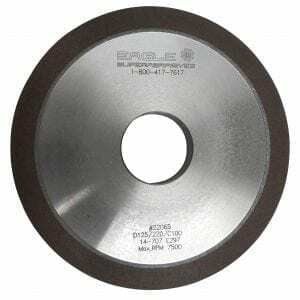 Diamond Wheel For Machining | Eagle Superabrasives Inc.
Eagle Superabrasives is a premier supplier of superabrasive supplies in the United States. With an extensive inventory of over 6,000 diamond wheel, cbn and cdx wheels in stock at our Hickory, North Carolina location, we are able to ship ninety-percent of orders same day. Custom orders can be filled in as little as seven days. We specialize in the manufacturing of high performance grinding wheels that will last long and improve productivity in the workplace. With fewer wheel replacements and a higher stock removal our diamond wheel lineup is a great investment if you are looking to boost your productivity rate and save money in the long run. Currently we are able to manufacture our diamond wheels on six different core materials with a variety of bonds. The bonding system that is used on the wheel, has a large factor on the wheels life. Diamond is such a superior superabrasive that its only limiting factor is the bond. Typically the breakdown of the bonding layer causes the subsequent separation of the superabrasive to be removed from the wheel core. To ensure the integrity of our wheels, our chemist and engineers work constantly on testing and developing specially formulated bonding systems. As mentioned before, we are able to manufacture our wheels on six different core materials and as thin as 0.2mm and up to a maximum diameter of 700mm (27-½”) and anything in between. A truly customized wheel to fit your business needs. Our bonding system is formulated in house and are based on the core that is chosen for the wheel. The bonds that we use on diamond wheels are phenolic and polyamide which are both resin bonds. CDX bonds which are a mix of both diamond and cbn powders as well as hybrid and and a metal bond. Each bond style holds an advantage over the other and is important to consider when choosing a wheel to fit your business needs. When you’re ready to try the best, trust the experts at Eagle Superabrasives. We not only pride ourselves in our wheels, but the quality of our customer experience. Our experienced staff is dedicated to providing our customers with high quality products and unequaled service. We offer experienced technical support and advice to assist you along the way. Contact us today!